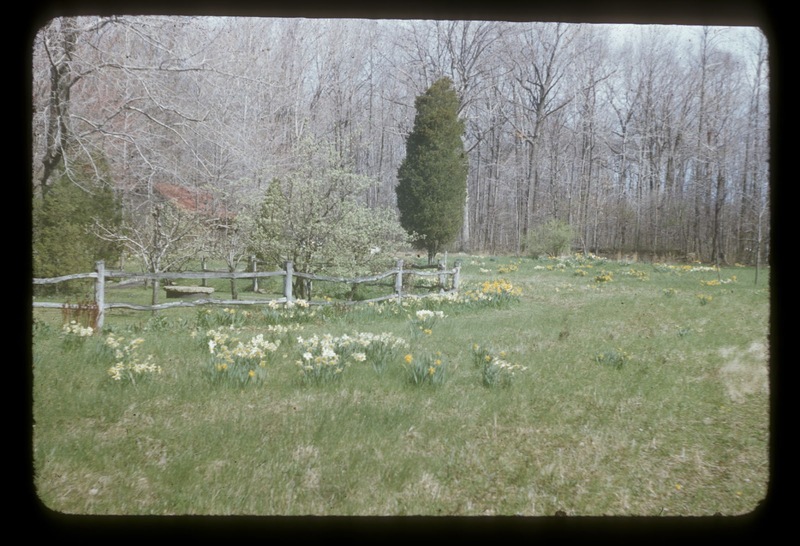 Thanks to a former tenant of the Veblen House, we have many photos that show the Veblen's garden in the 1950s, when both the famous mathematician and his wife were still alive. In this photo, the field to the left of the house is filled with daffodils, a particular passion of Elizabeth's. Though daffodils look lovely in a field, they tend to die out if the field gets mowed before the daffodil leaves have harvested enough solar energy to make blooms the next year. That's probably why the field today is nearly empty of daffodils. This Sunday, April 2 from 2-4pm, you're invited to join us as we continue the ecological and historical restoration of the Veblen grounds. Two recent events make Sunday's workday auspicious. Two weeks ago the field in this photo was badly damaged by two trucks that drove down to the house and got stuck. All those deep ruts and bare ground, along with daffodils available for rescue on a construction site nearby, suggested an opportunity to bring back daffodils to the field. That should be a fun project for volunteers. If we plant daffodils in the ruts, we'll want to make sure the field doesn't get mowed this spring, or in springs to come. Daffodils have more to do with restoring history than ecology. More of an ecological nature, we'll also plant some rescued local native hazelnuts and pawpaws in areas recently cleared of invasive brush near Veblen House. As with the pawpaws planted last year, we'll stake and protect the new plantings with wire fencing. The plantings are part of the envisioned "ecological campus" on the grounds surrounding the Veblen House and Cottage, on the east side of Herrontown Woods. 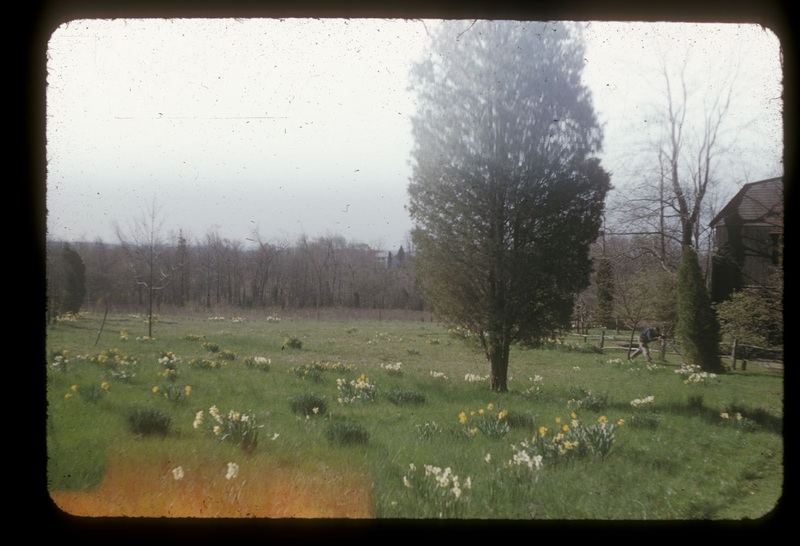 Here's another view of the field that Elizabeth Veblen had planted with daffodils. She grew up in York, England, where daffodils ornament the berms of castles. You're encouraged to come whether you can do physical work or not. You can always lend moral support and hear the latest news. We'll have refreshments. Kids welcome. Park down the driveway across the street from 443 Herrontown Rd, or walk up from the Herrontown Woods main parking lot. One theme running through the Veblen House project is the capacity to see potential where others do not. Beneath its rather dilapidated outer "skin" is a house that is solid and extremely well crafted, with an intact roof and solid foundation. People who look no further than the outer skin won't see the quality hidden underneath. The same story can be told of a hazelnut tree that was cut down along Snowden last year when a lot was cleared for a new house. I had spotted the hazelnut tree years prior. Calling hazelnuts a tree is a stretch. They grow about fifteen feet high, and instead of a trunk they grow a dense cluster of stems from a gradually broadening base. I knew that, once cut down, it would sprout many new shoots from the root. The photo looks like a pickaxe lying on plain ground, but I knew there was treasure to be had. I asked the owner of the new house if I could rescue the hazelnut and plant the root sprouts at Veblen House. He agreed, and the harvest was 8 sprouts, plus 8 chunks of root that could sprout if planted. We may invite the public to join us for this planting, most likely in a moist forest opening where the hazelnuts will get enough sky light to bear well. The opening was cleared of invasive shrubs over the winter by Friends of Princeton Open Space board member Kurt Tazelaar. The field next to the Veblen House was left badly damaged by ruts and a pile of road salt, most likely on March 22nd or early on the 23rd. Though it appeared at first to be a joy ride that turned into a quagmire, evidence suggests that a consultant working for Mercer County may have driven across the lawn down to the house, despite slippery spring conditions. The truck got stuck and then another truck may have been called in with a winch to pull it out. That truck may also have gotten stuck. Boards and the salt/sand mixture were apparently used to extricate one of the trucks from the mud. The cable across the driveway, protecting the Veblen site from unauthorized access, was also down. A tag for a winch was found on the grass nearby. On December 7, the Mercer County Parks Commission voted to spend $23,000 on "permitting support services" that are a preliminary step leading to demolition. This action came as a complete surprise to the Friends of Herrontown Woods (FOHW), the nonprofit that has been restoring and maintaining trails at Herrontown Woods for three years, at no cost to the town or county. The county is well aware of FOHW's desire to rehabilitate the Veblen House and farmstead so that they can be an asset to the community. Mercer County, which owns the buildings and land, has long wanted to demolish them and put up a plaque. The preliminary move towards demolition put FOHW in high gear to complete its proposal to repair the buildings. On February 3rd, after intense work, the FOHW board submitted to the county a detailed proposal to acquire the buildings and use its own funding to put them to public use for educational programming about the extraordinary history and ecology of Herrontown Woods. On February 16, FOHW followed up with a submission of all insurance documents, and requested permission to begin working on the buildings so that their enduring quality and potential can be clearly demonstrated to the community. The buildings have been boarded up since 1998, but both were very well made, and the Veblen House in particular is still solid, with roof and foundation intact. FOHW also asked the county to suspend all further actions towards demolition. Despite repeated followup inquiries, FOHW has received no response. The ruts in the lawn and the downed gate may be a sign that the county has instead been spending money to move forward with its plans. FOHW is seeking a positive solution for all the supporters of Veblen House and Herrontown Woods, for the community and for the county, which could save considerable money that would otherwise be spent on demolition of these unique historic structures. 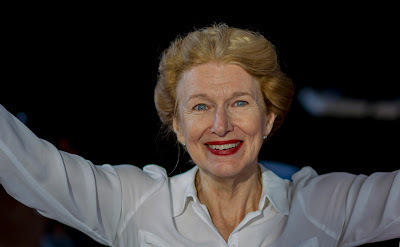 One year ago, June Ballinger debuted her solo performance "Remembrance Day", about her mother's work in WWII England at Bletchley Park, where mathematician Alan Turing was leading the effort to decode the Nazi Enigma machine. Over the past year, June has worked with director Janice Goldberg to develop the one woman show further, including research on the math involved with code breaking. Alas, I have been distracted and have not posted about her performance tonight, March 4 at 7:30 at Passage Theatre of the new version, which I hear is excellent. If you haven't checked out Passage Theatre, it's a gem, with some of the finest theater productions in the area. The critical role women played in WWII mathematics and computer development is a recurring theme on this website, including an update at this post about women in my home town in Wisconsin who, according to Nobel Prize winner Chandrasekhar, calculated "immensely difficult mathematical equations entirely by long hand". June tells me her mother "thought math was great fun ... she loved it." "There is a basic formula my mother and all folks working in the Newmanry had to understand: The formula for the Fish machine." "The Newmanry was a section at Bletchley Park, the British codebreaking station during World War II. Its job was to develop and employ machine methods in Cryptanalysis of the Lorenz cipher. The Newmanry was named after its founder and head, Max Newman. It was responsible for the various Robinson machines and the ten Colossus computers."